Carpet manufacturers apply protectors at the factory to help your carpets stay cleaner longer. Carpet Protector provides a barrier that makes it difficult for dirt particles to cling to carpet fibers, and helps to prevent water based spots and spill from becoming hard to remove stains. This protection is worn off over time due to foot traffic, abrasive soil, and vacuuming. 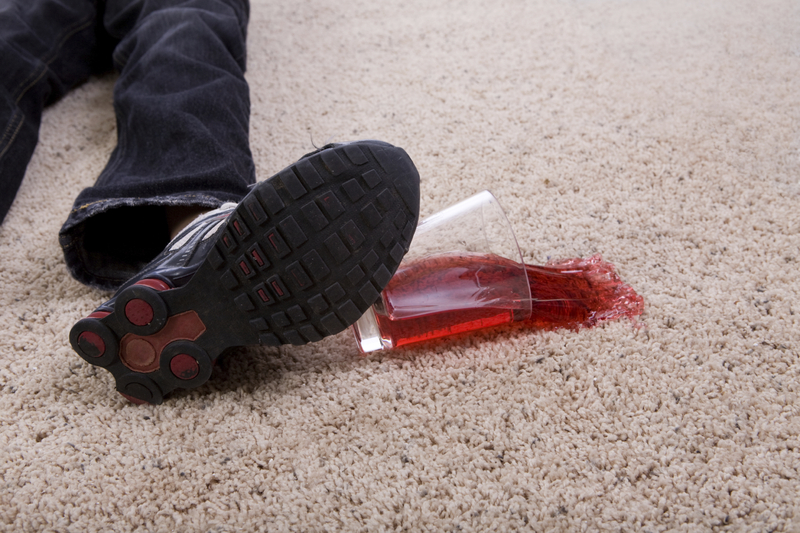 Studies have shown that within as little as one year over 50% of your carpets protective qualities can be worn off. Having the protector reapplied helps slow down the formation of traffic patterns by allowing you to get more dirt out of your carpet with your vacuum cleaner. Your carpet looks cleaner longer. And a cleaner carpet means less wear and a brighter appearance. Regular foot traffic – In as little as 6 to 12 months depending on the traffic, a significant amount of protector can be worn away. Without protector, the carpet is vulnerable to staining and fiber wear. Carpet protector should be reapplied. A great looking carpet can be ruined by any ugly spot. Unprotected carpet does not repel spillage as well as protected carpet. As you can see, without protector, the red wine spill soaks into the carpet almost immediately. When the protector is present it suspends the stain from setting in the fibers. Protector buys you time, so you can easily remove the stain. Being able to remove spots and spills more effectively prevents permanent staining. Have you ever noticed how traffic areas dull out over time? This is because soil is very abrasive like sandpaper and it scratches fibers which reduces their ability to reflect light giving it a “dull” look. Another great advantage of protector is that it allows abrasive soil to be easily removed from the carpets, and this prevents the carpet fibers from being destroyed. Vacuuming the carpet and releasing the soils from the carpet fibers greatly increases the life of the carpet. By applying protector, you will dramatically increase the life of your carpet. Less dirt in the carpet = Less damage to the fibers. The easier a spot is to remove, the less cleaning solution you will have to use. The less agitation you must use, and less time it will take. Many spots can be easily removed with just soft water. Having carpet protector applied to your carpet will enhance your next cleaning. More soil will be removed the next time your carpeting is professionally cleaned. Although you may want Mighty Clean Carpet Care to handle any spot or spill, carpet protector helps you remove spots that would be set in unprotected carpet. You may be able to save a minimum service charge by removing the stain yourself. Not Using High Quality Protector. Discount protectors are not as effective and sometimes void the warranty of the carpet. Mighty Clean Carpet Care uses only the highest quality, recommended protectors. Not Using A Dedicated Container. Not Applying The Product Properly. Some cleaners either under apply or over apply the protector. Under applying it doesn’t allow for complete penetration on the carpet yarns. Over applying it causes the carpet to become overly stiff and crusty. Mighty Clean Carpet Care technicians are diligently trained for proper application. It is acid based and for the most part is clear. This dye is used to fill in extra dye sites in the carpet fibers. The dye blocker prevents other dyes from entering the carpet fiber such as those found in teas, coffee, fruit juice, and inks. By stopping the new dyes from penetrating the carpet fibers, the stain won’t set in, and it can be removed much easier by common home cleaning methods. This is the fiber protector commonly marketed as 3M Scotchgard ® or DuPont Teflon®. There are two functions for the fluorochemical. First it helps to stop spills from reaching the dye blockers. Secondly it resists soils from attaching to the carpet fibers. The fluorochemical creates a molecular shield around each carpet fiber. The shield lowers the surface energy of the carpet fibers causing them to repel liquid, spills, dust, and dirt. This helps prevent soil and stains from being ground into or absorbed by the fibers. By resisting dry soil, less soil bonds to the carpet, therefore the soil is picked up by your vacuum or cleaning. Making sure that you have a sufficient amount of protector on your carpet will help keep the soil from bonding to the carpet. Once it bonds to the carpet, it acts like sandpaper on your traffic area. Once the traffic area yarns are broken down, there is no way to bring them back to their original state.